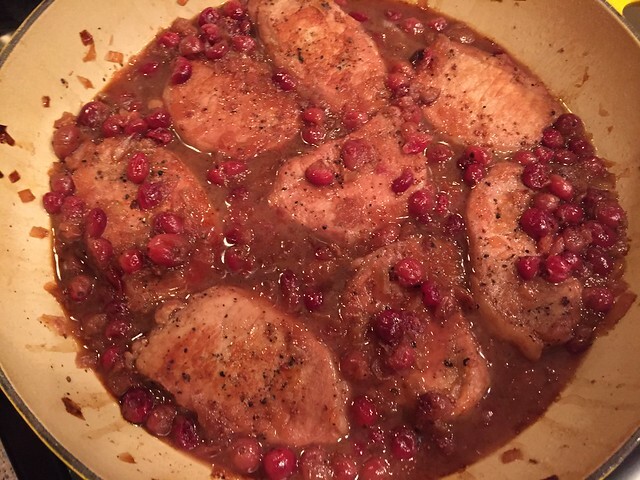 Baked Pork Chops with Cranberries is the perfect recipe if you’re looking for something a little different to add to your holiday lineup. It’s simple to put together and the cranberries add a nice festive touch. 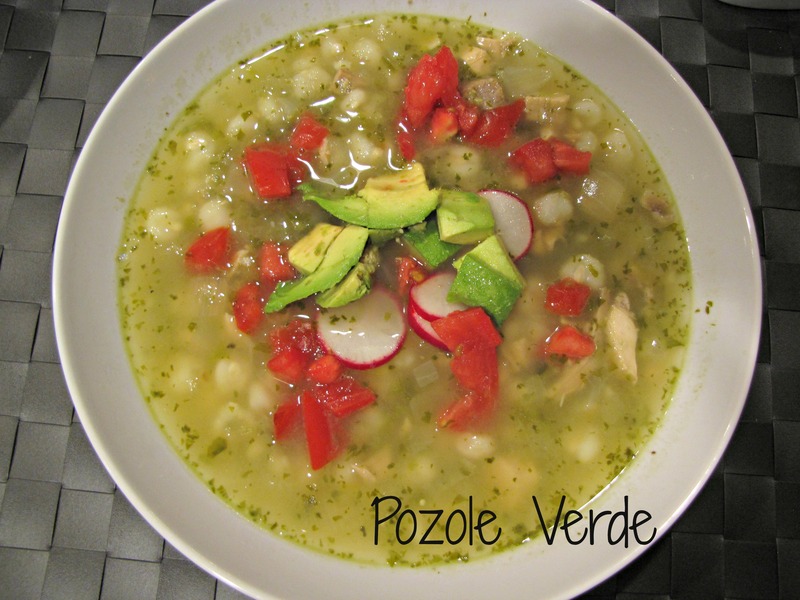 If you’re feeding a few or a crowd, this recipe is very easy to adapt and makes great leftovers. Because it bakes in the oven, you won’t be slaving away over a hot stove while everyone else is having fun. In fact, you can cook these ahead and reheat them with great success. We’re winning on multiple levels with these chops. I love this recipe because it uses whole cranberries. I always buy a couple of extra bags at the holidays and stash them in the freezer. 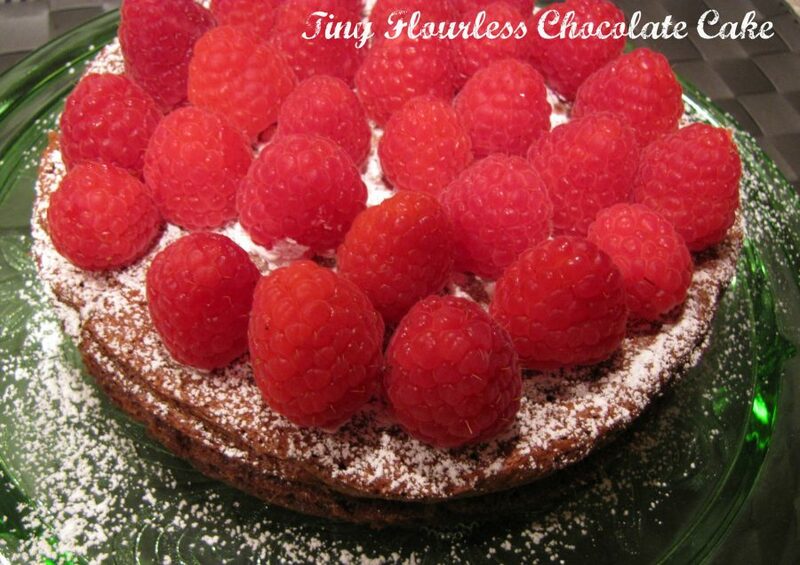 Both fresh and frozen berries work well in this recipe. 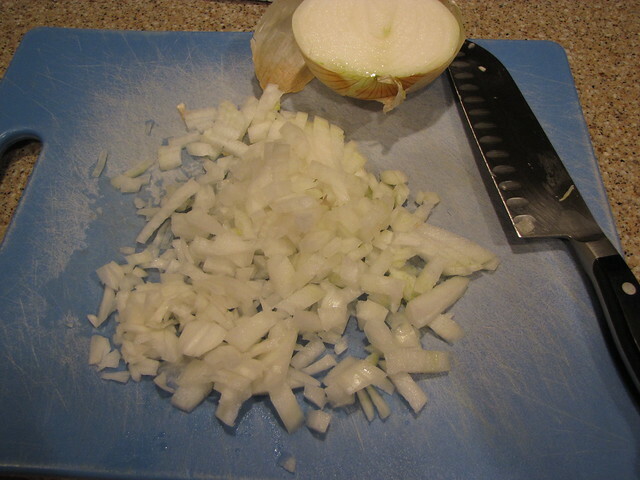 Finely chop 1 medium onion, about 1 cup. For the pork, I have 4 butterflied, boneless, center cut chops. I’m cutting them in half since they are huge and also to keep them from curling up when they cook. For me, half of one of these chops is plenty. Jim usually eats a whole chop so you can judge how many people (4-8) you will be serving. Season the pork lightly with salt & pepper on both sides. 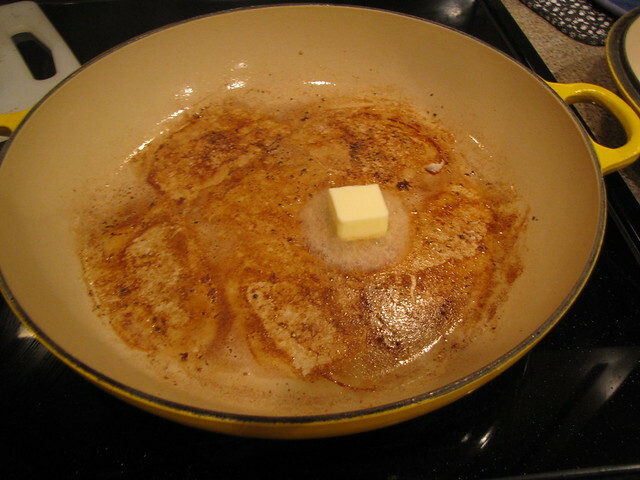 Heat 2 Tablespoons of olive oil in a large skillet over medium high heat. 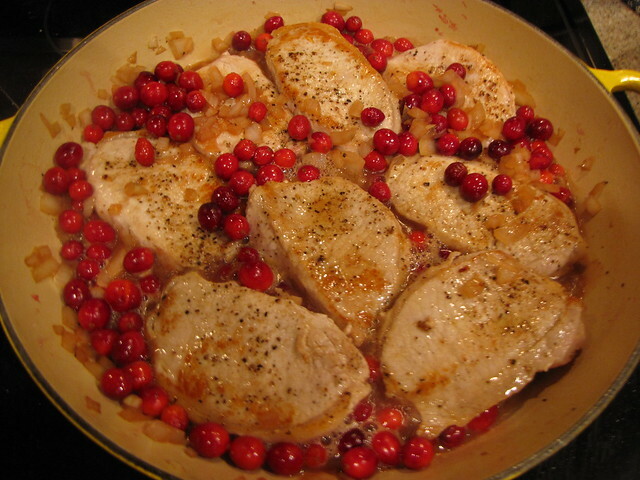 If your skillet is oven safe and large enough to accommodate all the chops and the cranberries, you can go directly from stove top to oven. 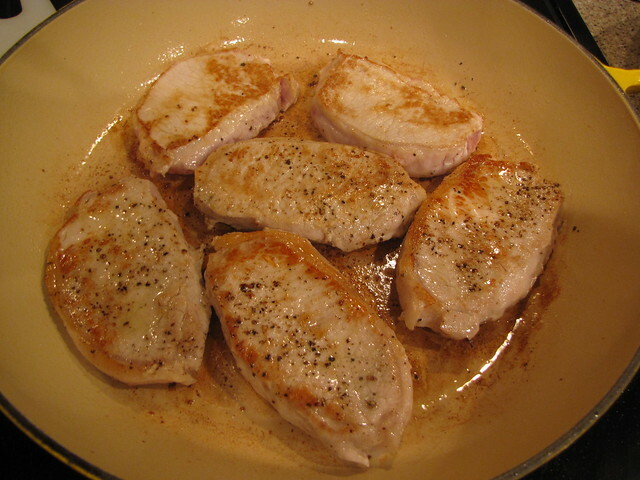 If your pan is not large enough, once the chops are browned and the sauce has been made you can transfer everything to a large baking dish like a pyrex 9×13 inch pan. Brown the chops on both sides until golden, about 3 minutes per side. Be sure not to crowd the pan. I’m doing my chops in 2 batches. It’s fine if they are crowded once they’ve browned but if you get too many chops in the pan at first, they will steam rather than brown. 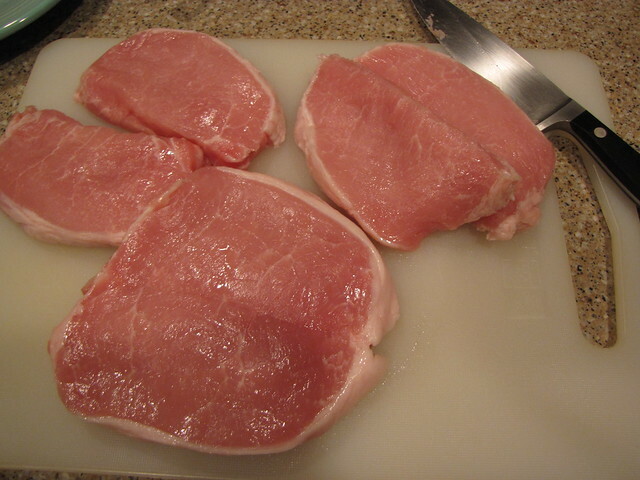 Once the pork is browned, remove the chops to a plate. If you have sufficient grease left in the pan, you’re good to go. My pork was pretty lean so I added 1 Tablespoon of butter to the pan. 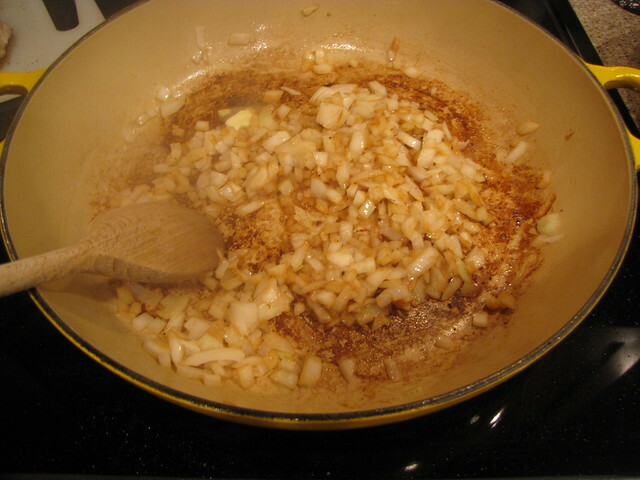 Add the chopped onions and sauté until golden. Use your spoon to scrape up all those good browned bits from the bottom of the pan. 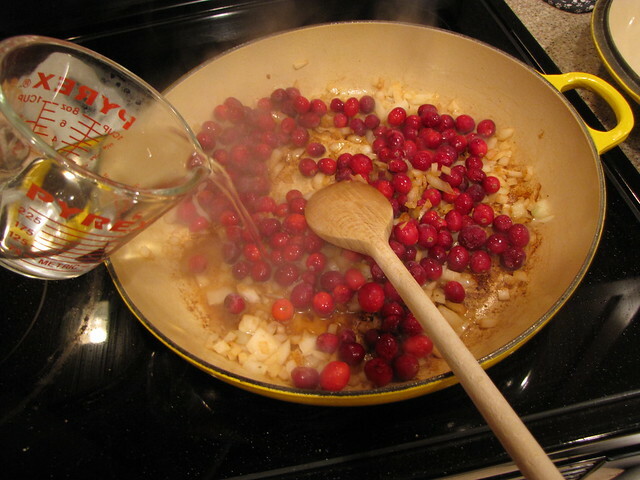 Add 1 (12 ounce) bag of cranberries (that’s about 2 cups), ½ cup water, and ¾ cup sugar. 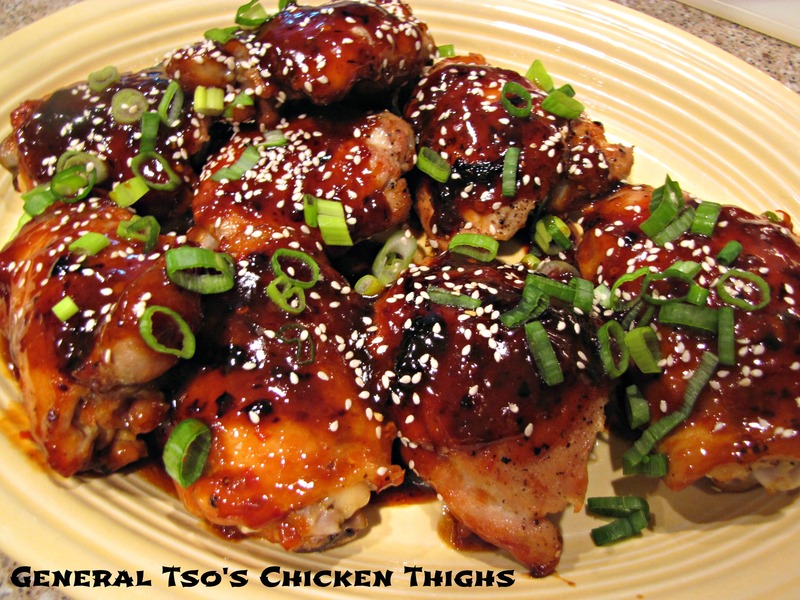 My neighbor Jody makes a recipe very similar to this and her recipe also uses 2 Tablespoons of spicy brown mustard in the sauce. I’m definitely adding that next time for a little more zing! Stir to combine and disolve the sugar. Keep scraping those tasty bits up from the bottom of the pan. 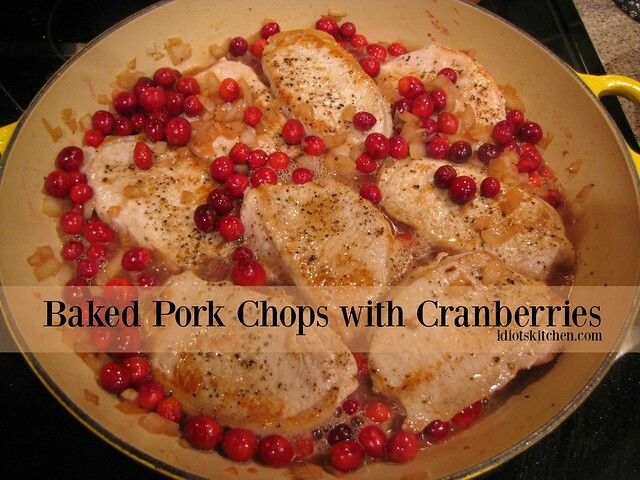 Nestle the pork chops beneath and around the cranberries. Don’t fall in love too much with those gorgeous bright berries…too bad they can’t cook and still look like that. Cover the pan and bake at 350° oven 45 minutes until the chops are tender. If you need the sauce to thicken a bit, you can uncover the pan for the last 5 minutes of cooking. 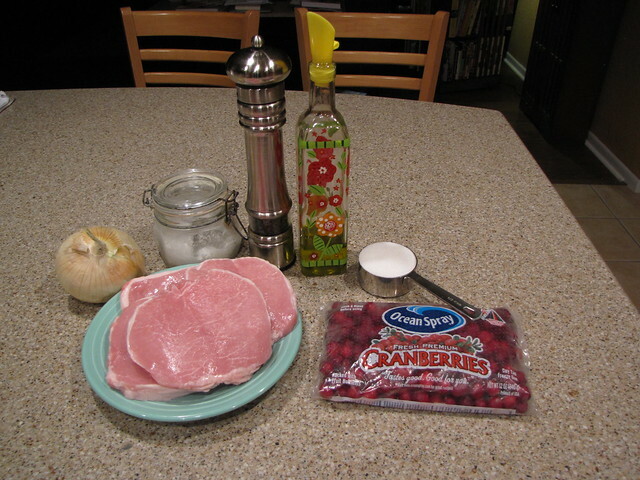 Serve the pork with the cranberry sauce spooned over the top. 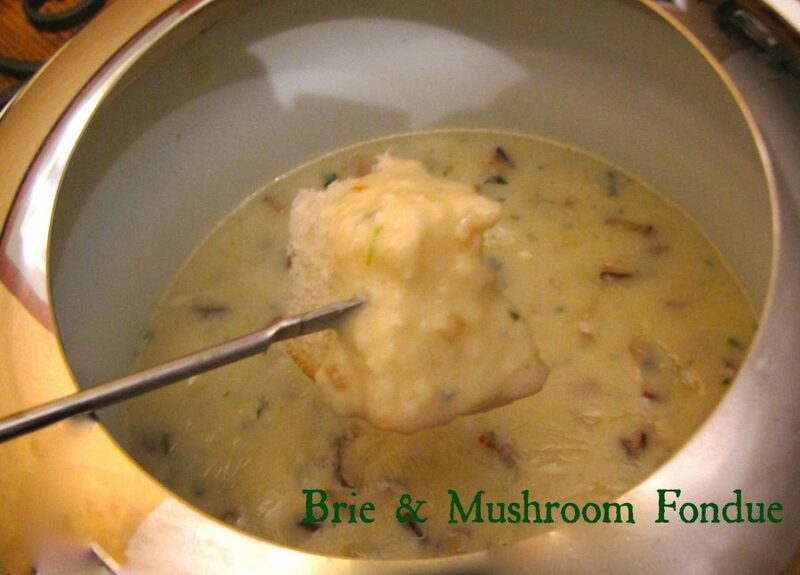 I had some cheesy broccoli casserole with mine but mashed potatoes would also be a great idea. Anything to catch all that good sauce! 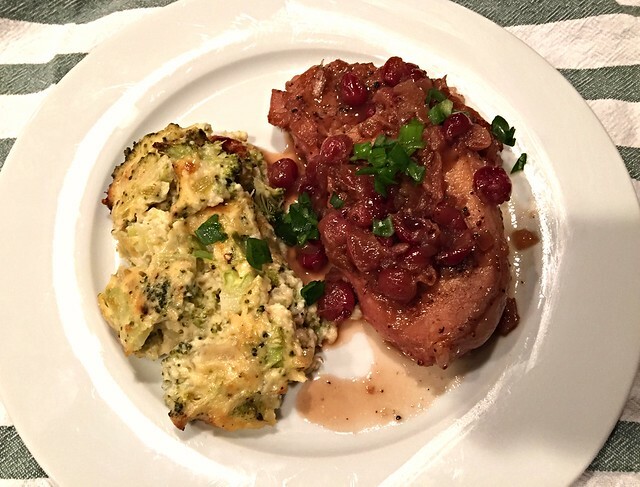 Baked Pork Chops with Cranberries are a festive addition to any holiday menu but you don’t have to save them just for special occasions. They’re so easy to make you can have them for any weeknight dinner. Plus they make great leftovers that you can freeze or eat for meals throughtout the week when you’re too busy to cook. Remember to stock up on some extra cranberries while they’re in the stores so you can make this all year round!